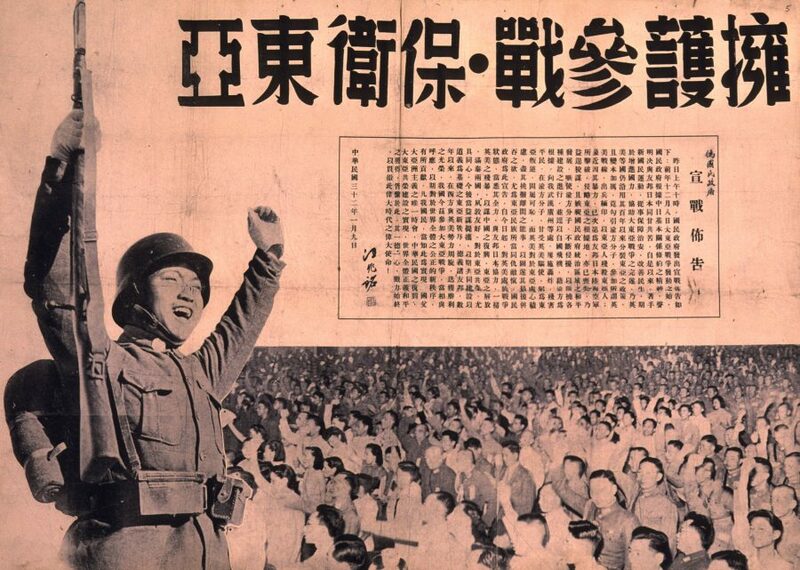 Poster of Chinese soldier celebrating the declaration of war on the Allies in 1943. Poster of Chinese soldier celebrating the declaration of war on the Allies by RNG China. The poster reads “Yonghu canzhan, baowei Dong Ya” (Support the declaration of war; defend East Asia), and includes the text of Wang Jingwei’s declaration of war on the Allies on 9 January 1943. Note that some postwar owner of this poster has written “wei guomin zhengfu” (bogus National Government) to the right of the text by Wang Jingwei so as to clarify which Chinese administration was declaring war on this occasion.